Have you ever despaired of not having a place to gush over Frederic Malle's Carnal Flower? The dream has been realized. Frederic Malle has joined facebook. So far the page has discussed the candles, included quotes from the new book "Frederic Malle: On Perfume Making" and the greatness of Une Fleur de Cassie. This fragrance does not get enough love or appreciation. Let us all wish for a Frederic Malle twitter account for 2012. For now...go become buddies with the rascal that is responsible for all my fragrance lemmings! Title: We're Going To Be Friends by The White Stripes from White Blood Cells. I just opened the press release for Lancome's Spring 2012 collection. I had to post it because it looks like a spring collection should look like. It is bright cool waters and whispery pinks. Like a tropical paradise. You just want to jump in that picture. 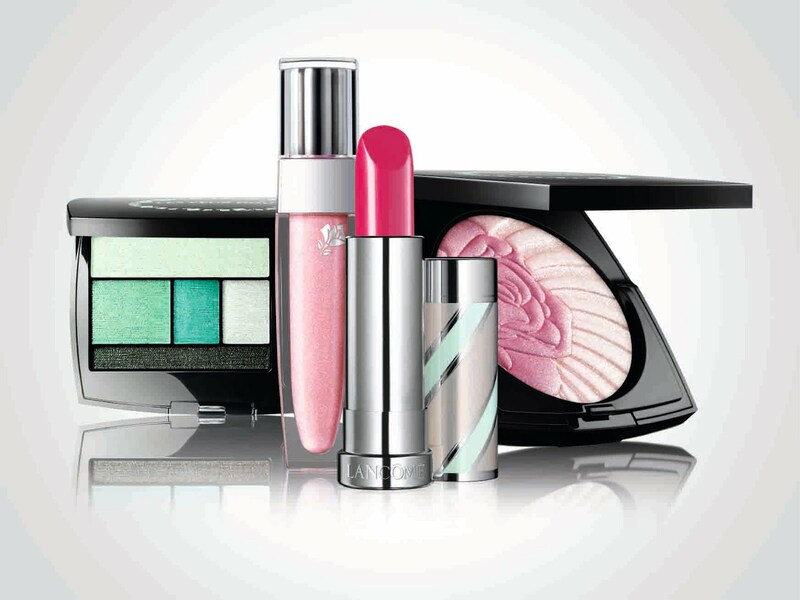 I love the looks of the pink powder with the etched Lancome rose and that lipstick tube. I am currently having a "mint" moment. I have been "missing in action" once again. I want to thank everyone who has checked in with me on twitter. A special shout out and thank you to ellemazing101, selfstyledsiren, boisdejasmin, alyssaharad and lipstickrose for the final push to get this blog back into gear. My friend Christine is going to revamp and convert the blog to Wordpress. If you have any ideas to make this site better and modern....please contact me or leave a comment. I have been out of the game...so I need to know what gets on readers nerves...besides not blogging! Inspired by a rose garden on a balmy, tranquil afternoon, the collection features blush, eyeshadow palettes, and lip colors in soft pinks and greens. Aaron De Mey hoped to capture the palette of summer nature, translating water, sun and sky into makeup shades that illuminate both sun-kissed and fair complexions. La Roseraie Illuminating Powder, is a multi-color powder blush embossed with a delicate rose. This looks so pretty!